The ultimate resource in the voice space. Conversational interfaces, voice interfaces, smart speakers and smart assistants, voice strategy, audio branding. The voice app killer was subject of some debate (Twitter-bate) this week after an article by Bloomberg outlining that Amazon Alexa has 80 000 skills but This platform is almost four years old, and you can’t point me to one single killer app. Voicebot also published an article related to it with a slightly different take: killer apps are already here, what comes next? What we are likely to see is a series of killer apps some of which may be localized to a particular surface. For example, voice interactive navigation may be a killer app for the car, but only a minor benefit for smart speakers and inconsistently used on mobile. Global marketing company The Mars Agency has partnered with US drinks retailer BevMo! to trial a voice-activated, digital whiskey shopping assistant, according to a post by The Spirits Business. The Mars Agency’s Smart Aisle platform has the intention to assist shoppers with product selection, and offer information and educational tools at the point of purchase. The platform combines a voice-activated interface, artificial intelligence and LED shelf lights. Smart Aisle will ask shoppers questions about their whiskey preferences and then filter the assortment down to three recommended bottles, reading out names and descriptions. Shelf lights highlight the locations of the recommended bottles. The platform will be tested at BevMo! stores in California in Oakland, San Jose, Santa Clara, Mira Mesa, and Carmel Mountain until the end of March. The latest test for the platform follows a trial in New York for a similar Smart Aisle whiskey selector. The two-month pilot resulted in a 20% year-on-year sales lift for the featured bottles and positive feedback from shoppers. 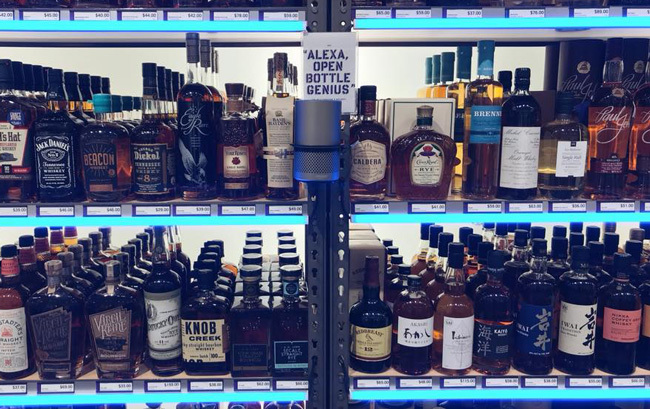 Using Amazon’s Alexa Skills Kit (ASK) capabilities, the Bottle Genius skill for Alexa provides a personalized, voice-powered customer assistant that helps shoppers in Bottlerocket’s whiskey aisle. Customers can receive three curated whiskey recommendations after answering basic directional questions such as current favorite, purchase occasion, or desire to try something new. The service also provides tasting information as well as the opportunity to learn more about the brands. “We believe voice technologies like the Bottle Genius skill powered by Smart Aisle will trump mobile as the preferred mode or interface for shoppers within the next five years”. Rob Rivenburgh, CEO of The Mars Agency North America pointed out “Industry advances like Smart Aisle will continue to transform the way people shop for products and services with their favorite retailers. It wouldn’t be fair to start this summary with anything else than appreciation for the work Bradley Metrock and his team pulled out organizing the conference. As I said the first day at the conference, it’s very strange to not stumble into a technical or logistical problem while setting up a booth at a conference. And yet, that was exactly the experience we had Tuesday, January 15, when we arrived at the booth. From there, everything continued to run smoothly. Voice is maturing, Brett Kinsella one of the keynote speakers of the conference and Editor of Voicebot.ai name it as a second phase of voice in terms of adoption, competition in the space and the integration of voice tech into existing products, this point of a second phase of voice has also been spoken by Brian Roemmele. Voice in the car: There has been a lot of enthusiasm around the connected car in the recent months as it seems is the next battleground for voice technology companies. Healthcare generated attention: Lots of interest from attendees, voice is making its way to healthcare and incumbents like Mayo Clinic and Orbita are leading the way. Sonic branding and personality in voice are gaining momentum: Several of the sessions and talks were dedicated to this topic, a hot one in an industry growing as much as voice. Differentiation through personality signals a way for brands to stand out in voice technology platforms. Storytelling is getting a space: Tellables and X2Games were some of the companies that are presenting an interactive storytelling with smart assistants. What they are doing is at least intriguing and worth checking out. Founder of Atari presented their latest game: St Noire, an intersection between stories, interaction and gaming. Nolan Bushnell also pointed out that half a billion dollars are going to be dedicated to interactive entertainment 🤯. Podcasts and publications like Voicebot.ai, Bettlement Movement Marketing, Alexa in Canada, VUX World and may I dare to say VoiceFirst Weekly do provide value for users entering the space. It is the impression I took partaking in several conversations and observing visitors at the floor. I was part of the Storytelling track in the panel Podcasting in the age of Alexa. Audioburst, Gimlet Media and Amplifi were the other companies debating in the panel, which turned out to be very insightful, given we were all from very different backgrounds. The biggest problem for podcasters in the age of smart assistants is the same where smart assistants were not in the picture: distribution. According to Steve Goldstein from Amplifi Media, there are 600 000 podcasts of which 70% are dead. Which means podcasting is easy to start, difficult to maintain and even harder to monetize. However, as it turns out, both smart assistants and podcasts have signaled 2019 to be “their” year as the public and brands are more aware of them and the growth is outstanding. From my point of view, short episodes are going to be paramount soon, as well as storytelling podcasts. In that regard, Gimlet Media is leading the way with their productions that awarded them an Alexa Conference prize. 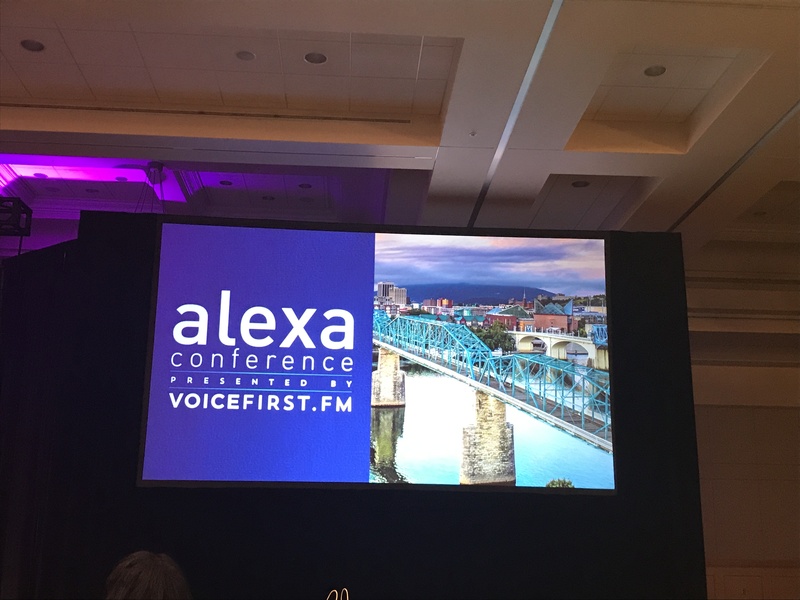 The Alexa Conference social media channels broadcasted several live streaming interviews with presenters at the Alexa Fair and other voice thought leaders . You can catch each of them in VoiceFirst.fm Youtube channel. The stage where I spent most of the time was the Alexa Fair Exhibition. 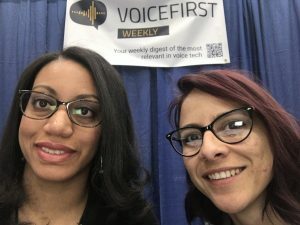 VoiceFirst Weekly had a booth in the podcast section. What I highlighted in our Final Thoughts of the Alexa Conference with Ian Utile was how intimate the fair felt. Visitors had the opportunity to talk for half an hour with the presenters. This doesn’t happen in bigger conferences where you might have time to only exchange cards. What else the fair taught me? What companies are doing in the voice space. It was a timely reminder that despite everything I mentioned above about the growth of voice technology, it’s still very early in adoption and business opportunities. My forecast is that is going to be a lot of pivot in the years to come, and not all players will make it to home base. That’s fine and expected. Most conversations included the question: what do you think about monetization, or do you know how people are monetizing or who is monetizing? Along with “we are still figuring it out”. Aren’t we all. The best of it all though was the opportunity to interview almost all companies presenters, including executives answering two questions: what do they do, and why did they think of the Alexa Conference as a space to showcase their products. This interviews will be available at the end of next week when we are relaunching VoiceFirst Weekly podcast, after a process of rebranding. Stay tuned for those, it is full of insights from the leaders of the companies that are driving voice technology. Apple’s HomePod will be available for sale in China early next year. A listing is already up on Apple’s China site, with the smart speaker priced at RMB 2,799 (about $407), or about 17% more than its $349 price in the United States. Though Apple doesn’t list an exact shipping date for Chinese buyers, it says the HomePod will be available in early 2019. Apple has balls, let me tell you that. It’s going to launch a smart speaker in the hottest battleground with a (much) higher price competing against Tencent, Baidu, Xiaomi and Alibaba’s smart speakers. All of them combined has hundreds of millions of devices installed. And let’s not forget, way less pricey options, as low as $15 in sales. Yeap, and options, which in smart speakers, Apple does not have a lot to show. Is the company hoping that customer loyalty to iPhones is going to be translated to the HomePod? Despite formidable competition from Samsung, Huawei, and Xiaomi, Apple held an 11.9% market share in China as of the second quarter of 2018, according to Gartner (referring to the iPhone). With the announcement of Apple Music in Alexa, we know Apple is focused on its services or at minimum Apple Music. What I will like to see more, it’s their efforts in a more service-oriented Siri. It’s where every smart assistant platform is moving. Siri’s co-founder said in a CNBC interview that Apple dropped the ball in third-party voice partners, but they are the future. I completely agree. Google announced yesterday in their Canadian blog the introduction of new Google Assistant experiences for families. The announcement clearly focuses Google Assistant in a light of family-related activities, especially with kids. Today, we’re introducing new experiences, designed specifically for families with kids so they can learn, play and imagine together. 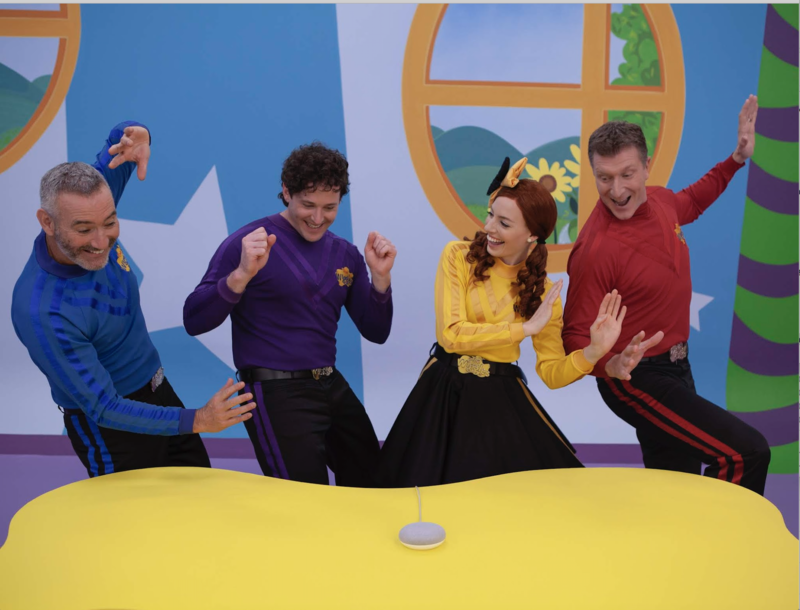 Among the new experiences, Google says families “will be able to join The Wiggles,” from the Treehouse TV show and go on a “custom Wiggles experience” commissioned by Google exclusively for Assistant. Google is also introducing news stories appealing to kids through CBC Kids News. It can be invoked by “Hey Google, Play CBC Kids News“. The feature is focused on daily, local, national and international stories that are relevant to Canadian kids with a focus on media literacy. Google Assistant recently launched storytime experiences in partnership with Disney. Along with these new services for Canadian kids, the search giant is shifting a lot of its focus to kids and family environment. Moreover, Reuters also released a report in which one of the main conclusions is that users don’t love news in smart speakers. By shifting to kids consuming news in Google Assistant, the company is setting news consumption in their smart speaker for the future. Smart. Another feature the blog post announced is Boukili Audio, an interactive activity that tests listening and comprehension of stories on animals, nutrition, music, travels and a ton of other captivating subjects, all in French. After listening to stories, Boukili Audio puts your child’s skills to the test with a series of multiple choice questions to evaluate their French language comprehension and their memory, all while having fun. Boukili Audio has over 120 interactive books, over 70 of which are exclusive to the Assistant. Available in French only. To Try it out Canadian users can say: “Ok Google, Parler avec Boukili Audio”. Just in time for Christmas, Google is announcing calls to Santa: “Hey Google, call Santa”. It’s only available in English. Can’t wait for this to be available in the US to see what Santa has to say. With their parent’s permission, children under 13 can also have their own personalized Google Assistant experience when they log in with their own account, powered by Family Link (Not available in Quebec). Family Link helps parents manage their child’s Google Account while they explore. And with Voice Match, your family can train the Assistant to recognize up to six voices. The announcement was in the Google Canadian blog yesterday Wednesday, November 28. It doesn’t specify when the family experiences are going to be available in other territories. Google focus on families and kids in the holidays is very smart. It proves the company is looking ahead and it’s not as concerned to “fix” current users’ view. After all, Generation V is the real protagonists in voice technology.